Based on the frequency of Desmond Cole’s visits, he can’t get enough of Halifax — or maybe Halifax can’t get enough of him. “I live in Toronto and I think a message for all of us is that our work can be very influential and it can cross boundaries If we work and use the resources that we have,” says Cole. The journalist and advocate will be a keynote speaker on Feb. 20 for Black Voice Perspectives, an event at the Halifax Central Library for African Heritage Month. This will be his third trip to Halifax in two years; he was here in the spring of 2016 and last October. Cole has a radio show on Newstalk 1010 where he talks about social justice to local economics. He advocates against carding in Toronto, which disproportionately targets black Canadians. Here in Halifax, there is an identical issue surrounding police checks. Cole views his time in Halifax as an opportunity to connect with local advocates and learn about African-Nova Scotian history. Cole, who grew up in Toronto, says until about three years ago he did not know much about historic black experiences in the province. Then he met El Jones. “How black people have contributed to this province is an interesting history that I feel I was robbed of throughout my formal education,” says Cole. Through his trips to Nova Scotia and connecting with advocates like Jones, Cole discovered a personal connection with the province. Jones says bringing Cole to Halifax is of great importance for those whose voices are often ignored. She encouraged the library to invite him to speak. “The opportunity to bring in an important black voice, pay them, and to build those connections is fundamental to how we build towards liberation,” says Jones. Cole was on Jones’ radio show, Black Power Hour, in October. The room was so full for the live recording on CKDU 88.1FM people stood in the hallways to listen. 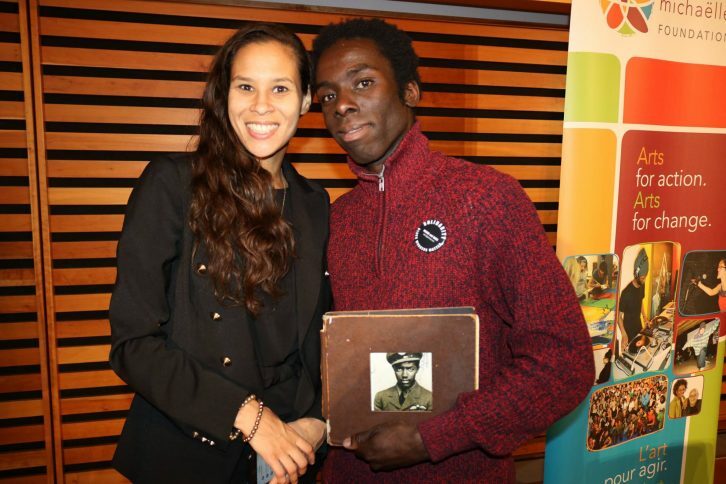 Many of the attendees were young people like Andre Fenton, a 22-year-old writer who is inspired by Cole’s “unapologetic voice” as a black man. “I feel that his presence is very important; the stories he brings to light are what so many of us feel, but often times told to be quiet about,” says Fenton. For Cole, there’s an opportunity in Nova Scotia to share knowledge and resources with the local black community. His goal is for his work to benefit the communities he’s fighting for. “On our side, we always believe that when black people achieve rare resources we have a responsibility to use those resources to build up other black people and to infuse that into our community,” she says. Dalhousie University student Claudia Castillo-Prentt is looking forward to Cole’s talk at the library and hopes it draws a large crowd. “Desmond’s presence in Halifax is important to remind people that racism is still alive and thriving in our community and that we will not be silenced,” she says. Cole laughs when he hears that people are eager for his return. “When I’m in Nova Scotia I’m amongst a lot of my people, and that feels great,” he says.